Many people around the world have little or no access to clean drinking water. The UN has declared that access to clean water and sanitation is a fundamental human right. About 1.5m children under five die each year from water and sanitation-related diseases. The resolution was passed with 122 nations in favour, none against and 41 abstentions. Abstaining countries said the resolution could undermine a process in the UN's Human Rights Council in Geneva to build a consensus on water rights. 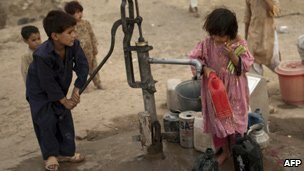 The text of the resolution said that 884m people have no access to safe drinking water and more than 2.6bn lack access to basic sanitation. It "declares the right to safe and clean drinking water and sanitation as a human right that is essential for the full enjoyment of the right to life". It urges the international community to "scale up efforts to provide safe, clean, accessible and affordable water and sanitation for all". Canada, the US, the UK, Australia and Botswana were among the countries which abstained from voting. China, Russia, Germany, France, Spain and Brazil were among those supporting the resolution. Portuguese lawyer Catarina de Albuquerque is due to report to the Human Rights Council in Geneva next year on countries' obligations related to water and sanitation. US delegate John Sammis said the resolution "falls far short of enjoying the unanimous support of member states and may even undermine the work underway in Geneva". Some countries said the resolution did not clearly define the scope of the new human right and the obligations it entailed, says the BBC's Barbara Plett, at the UN in New York.